Rottweilers are known for being very independant dogs. They like to be in control of their surroundings. They also like to run. So when you open your door, it is not uncommon for your Rottweiler to want to run out and take off down the street. This can be a frightening thing for a pet owner. Especially if you live on or by a busy street. It is every pet owner’s nightmare to think about their pet getting hit, lost, or even killed as a result of them dashing (running) out the door. Why Does My Rottweiler Do This? It is maddening to wonder why our dogs want to dash out the door everytime we open it. Their behavior may be due to several things. 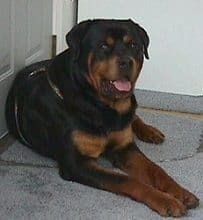 If your Rottweiler is not neutered or spayed, they may be dashing out the door because they want to find another male or female dog to mate with. This is something that is just instinct. Having your dog fixed/altered can help to prevent this behavior. Is your Rottweiler getting enough exercise? If you are not sure, but every time you open the door, your dog is trying to run out – they could be lacking exercise. They see the door open and also see an opportunity to run and have fun. If your Rottweiler is dashing out the door, you may have to take some responsibility yourself. If you have not started training your Rottweiler, you must start immediately. The dog cannot teach itself, so if you want to end this behavior, you must teach them that this behavior is unacceptable. This is no easy task when dealing with a 75 to 130 pound Rottie. Start your training early. The earlier the better. This way when they are full grown you won’t have to worry about trying to keep a large dog inside when they want to run off on you. First, you must teach your Rottweiler to respect the door. Put your Rottie on their leash and tell them to sit when you get to the door. Try opening the door and see if your Rottie tries to run off. 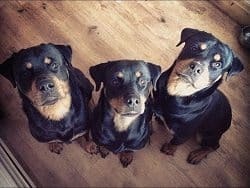 If they move towards the door, discourage them by telling them “no!” Continue this exercise until your Rottie no longer tries to dash out the door. Keep your Rottie exercised. If they have plenty of exercise, they are less likely to run off on you. Try making a noise maker. I like to use an old coffee can with a lid. Place some coins in the coffee can and when your Rottweiler gets too close to the door, shake the can. The noise from the can will distract as well as discourage your Rottie from doing what they were doing. An empty can of soda with a few coins works just as well. Finally, never hit your Rottweiler for dashing out the door. This only instills fear and aggression in your dog. If your Rottweiler fears you, they will definitely continue to try to run off on you. It is important to be your dog’s friend. Their companion. If your Rottweiler wants to spend time with you, they will be less likely to dash out the door. Always be patient when training your Rottweiler. Also, always use safety and caution when you are training. Make sure you always have your Rottie on a leash when training them not to dash out the door. We are trying to prevent accidents from happening, so make sure they are on a leash for their own safety.